Greetings from the Berg Adventures Office! 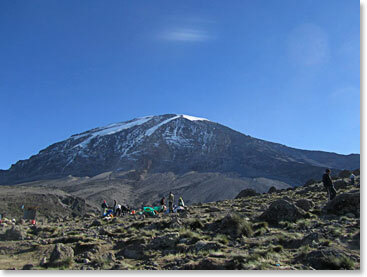 The team is resting tonight at Kossovo Camp at 15,968ft/4,867m. They called us after they arrived at camp, but part of the call was lost. Below is the transmission that made it through to our office. Bob’s message was lost completely, but Eric assures us that he is doing well and having a great time on the mountain. In fact, Eric has said that everyone is doing great. 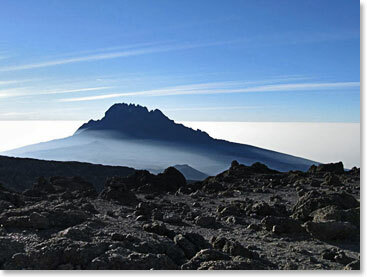 The team has decided to attempt the summit tomorrow. If all goes as planned, we will update you tomorrow with news from the summit! Hello this is Kyle. We made it to Kossovo camp about an hour and a half ago and….transmission lost. Hi this is Ryan. All is going well. I’m healthy. My legs are sore, but it shouldn’t keep me from the top of the mountain. Jennie, I hope all is well in Lawrence. I love you and the boys. Desi, I hope everything is going well there. Love to you all. Hi this is Michael. To Mom, Dad, Christian, aunts and uncles, and to everyone following, I really appreciate your excitement and support for me over the last couple of months. It has been an inspiration. I’ve felt a few altitude symptoms while trying to acclimate, but now we are at the highest elevation yet and I feel strong. I feel great. I am hopeful that tomorrow will go well. Maria, this is hopefully just the first of many mountains we will climb together. Your support has been amazing, I love you. This is Kyle again, not sure how much of my message went through earlier. Lorraina, Mom, Dad and Anne, I love you guys so much and can’t wait to see you in a week or so. Bye for now. A note from the office: We apologize for any names we misinterpreted or misspelled.